DNA sequencing is a technology in which several DNA strands can be sequenced through massive parallelization. This sequencing includes both Sanger’s method of sequencing and non-Sanger’s methods of sequencing. Advantages such as low cost, high accuracy & speed, and precise results even from low sample input are offered by DNA sequencing over microarray and other genomic analysis methods. DNA sequencing is used to execute various applications such as biomarker discovery, oncology studies, personalized medicine, forensics, and others. It has streamlined nucleotide analysis and consists of widely replaced conventional tools of genomics, especially microarray, genotyping, and others. The demand for DNA sequencing has increased significantly, owing to surge in sequencing applications and rise in technological advancements in DNA sequencing. In addition, surge in number of genome mapping programs globally and increase in R&D investment drive the market growth. The DNA sequencing market is segmented based on product, application, technology, end user, and region. Depending on product, the market is classified into consumable, instrument, and service. The applications covered in the study include biomarkers & cancer, diagnostics, reproductive health, personalized medicine, forensics, and others. By technology, the market is divided into, sequencing by synthesis, ion semiconductor sequencing, sequencing by ligation, pyrosequencing, single molecule real-time sequencing, chain termination sequencing, and nanopore sequencing. Region wise, it is studied across North America (U.S. and rest of North America), Europe (Germany, France, the UK, Italy, Spain, and rest of Europe), Asia-Pacific (Japan, China, Australia, India, South Korea, Taiwan, and rest of Asia-Pacific), and LAMEA (Brazil, Turkey, Saudi Arabia, and rest of LAMEA). Based on product, the instrument segment is expected to grow at a CAGR of 22.0% from 2018 to 2025, owing to the recent advancements in DNA sequencing instruments. According to application, the biomarker & cancer segment accounted for the highest share in 2017, due to increase in prevalence of cancer across the globe. Asia-Pacific possesses high growth potential in the DNA sequencing market, owing to increase in awareness about DNA sequencing and rise in DNA sequencing applications. Furthermore, this region is anticipated to experience fast-paced growth, in terms of development and use of DNA sequencing technologies. 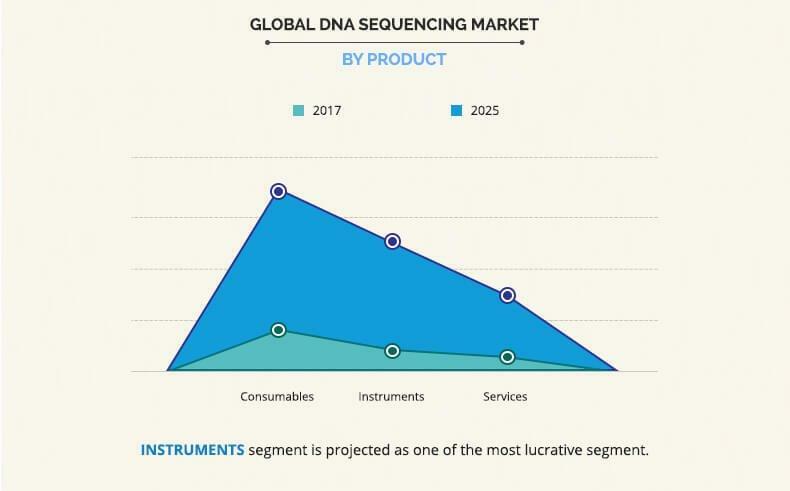 The key players operating in the global DNA sequencing market include Abbott Laboratories, Agilent Technologies, Inc., Danaher Corporation (Beckman Coulter, Inc.), F. Hoffmann-La Roche Ltd, Illumina, Inc., LI-COR Biosciences, Inc., Pacific Biosciences of California, Inc., SIEMENS AG, PerkinElmer Inc., and Thermo Fisher Scientific, Inc. The other prominent players in the value chain (but not included in the report) include Eurofins Scientific, Gatc Biotech AG, Macrogen, Inc., Oxford Nanopore Technologies, Ltd., Bio-Rad Laboratories, Inc., DNASTAR, Inc., Biomatters Ltd., New England Biolabs, Inc., and Myriad Genetics, Inc. This report entails a detailed quantitative analysis of the current DNA sequencing market trends from 2017 to 2025 to identify the prevailing opportunities along with strategic assessment of global DNA sequencing market. 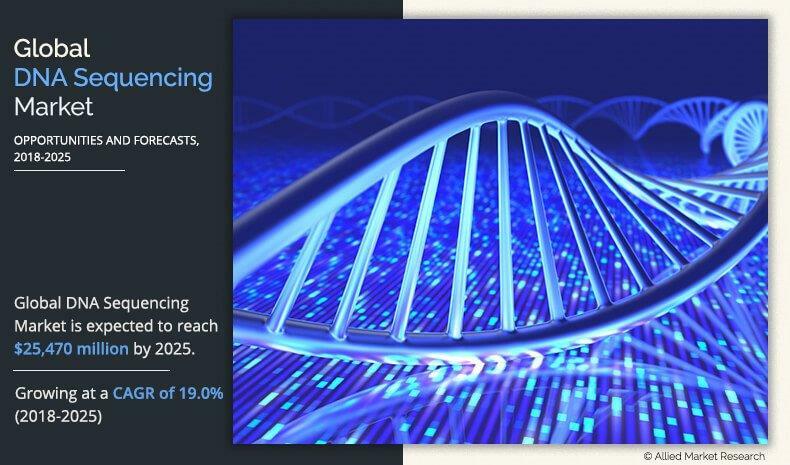 DNA sequencing market size and estimations are based on a comprehensive analysis of the applications and developments in the DNA sequencing market. A quantitative analysis from 2017 to 2025 to enable the stakeholders to capitalize on the prevailing market opportunities is discussed. Key market players are profiled, and their strategies are analyzed thoroughly, which help understand the competitive outlook of the market. 9.7. PACIFIC BIOSCIENCES OF CALIFORNIA, INC.
DNA sequencing has enhanced diverse fields of life-sciences by research, innovation, and development. Biomarker discovery, oncology studies, drug development, personalized genomics, and reproductive health are some of the widely-known applications of this technique. Similarly, DNA sequencing also contributed significantly in agricultural & animal and forensic research. This sequencing is anticipated to witness high adoption rate with increase in distinct applications and interventions, such as diagnostics, biomarker discovery, personalized medicine, and others. 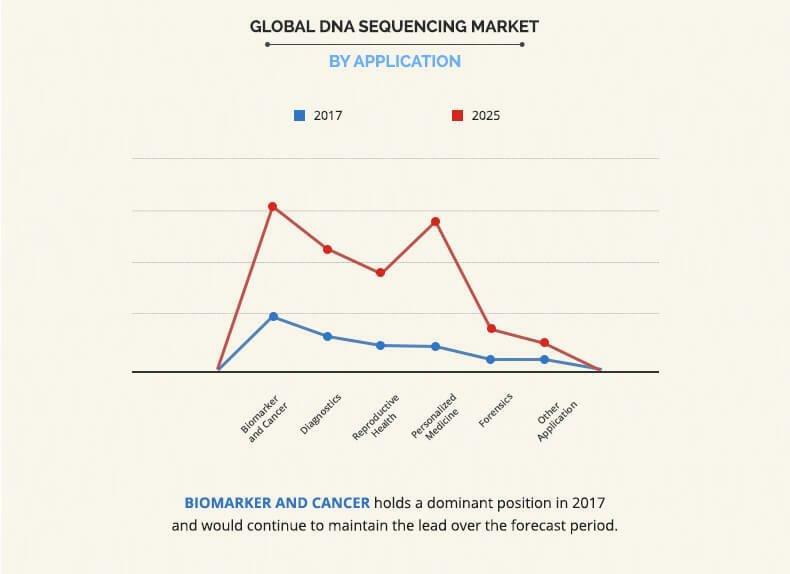 The market has gained momentum in the research, innovation, and development sector, owing to the increase in genome mapping projects globally, significant technological advancements in next generation sequencing, and surge in collaborations & partnerships among DNA sequencing product manufacturing companies. In addition, rise in awareness about DNA sequencing and its advantages drives the market growth. The demand for DNA sequencing has increased due to the reduced cost of sequencing and rise in the total number of produced sequence reads per run. However, standardization concerns in diagnostics based on DNA sequencing and ethical & legal limitations restrict the market growth. At present, academic & government research institutes are the largest end users of DNA sequencing, followed by pharmaceutical companies, biotechnology companies, and hospitals & clinics. The biotechnology end-user segment is expected to exhibit the highest growth rate throughout the forecast period. However, the utilization of DNA sequencing is higher in academic & government research institutes than other end users as DNA sequencing is routinely employed in hospitals for genomics research, biomarkers detection, transcriptomics research, and other purposes. Increase in awareness regarding sequencing and investment in research, innovation, and development fuel the demand for novel DNA sequencing technologies, especially nanopore sequencing. The employment of technologically advanced DNA sequencing products is highest in North America, owing to the increase in adoption of DNA sequencing products and technologies, followed by Europe and Asia-Pacific.